"With monks on the steps of the temple of the Sleeping Buddha"
Group photo with monks on the steps of the temple of the Sleeping Buddha. From left to right: Fr. 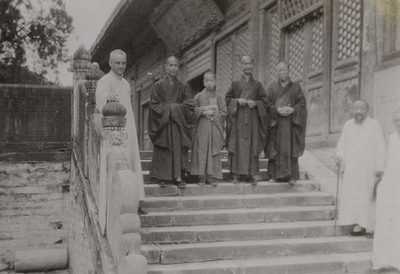 Paul Gilson; Buddhist monks; Fr. Jean-Baptiste Fan 樊, pastor of Anguo. With monks on the steps of the temple of the Sleeping Buddha. August 1933. Société des Auxiliaires des Missions (SAM) China Photograph Collection, Whitworth University Library, Spokane.